The Newhall incident, also called the Newhall massacre, was a shootout on April 5–6, 1970, in the Newhall unincorporated area of Los Angeles County, California, between two heavily armed criminals and four officers of the California Highway Patrol (CHP). In less than 5 minutes, the four CHP officers were killed in what became the deadliest day in the history of California law enforcement. At approximately 11:55 p.m. (UTC-8) on April 5, CHP officers Walt Frago and Roger Gore conducted a traffic stop of Bobby Davis and Jack Twinning in conjunction with an incident reported to the CHP minutes earlier. After initially cooperating with the officers, Twinning and Davis opened fire and killed both of them. Moments later, Officers George Alleyn and James Pence arrived on the scene and engaged Twinning and Davis in a shootout. A passerby tried to help by firing with an officer's weapon, but the three were outgunned. Both Alleyn and Pence suffered fatal injuries; the passerby ran out of ammunition and took cover in a ditch. After a third CHP patrol car arrived on the scene, the lone officer inside briefly exchanged gunfire with the perpetrators, but they fled the scene. Over three hours later, after stealing a vehicle, Davis attempted to flee the area; however, he was spotted by police and arrested. Meanwhile, Twinning broke into a house and took an occupant hostage. The house was surrounded by deputies of the Los Angeles County Sheriff's Department and at approximately 9:00 a.m., Twinning released the hostage; he died by suicide as the deputies entered the house. Davis was convicted and sentenced to death for the murders. His sentence was commuted to life imprisonment without the possibility of parole in 1973; he killed himself at Kern Valley State Prison in 2009. The Newhall incident resulted in a number of changes at the CHP, including procedural changes for arresting high-risk suspects and standardization of firearms and firearms training used across the department. All four officers had less than two years with the CHP. All were married and had a combined total of seven children. Jack Wright Twinning, age 35, and Bobby Augustus Davis, 27, were both career criminals with long histories of violent felonies. Twinning had been in and out of eight different federal prisons since age 16, including a five-year stint at Alcatraz, during which he killed another prisoner in self-defense. He had been released from a federal prison in Tallahassee, Florida 11 months prior to the shootings. Davis had been released from prison eight months prior to the shootings and was on parole in Houston, Texas. Twinning and Davis met and became friends in prison. After failing to land jobs following their release from prison, Twinning and Davis met up again in Houston, and drove to Sacramento, California, where they failed in their attempt to rob banks. They then drove down to Los Angeles in a 1964 Pontiac Grand Prix. En route to Los Angeles, they noticed construction along the highway in the mountainous area near Gorman and believed they could steal explosives from that site in order to commit a robbery. Twinning and Davis rented an apartment in Long Beach. Soon after, they began observing an armored car delivering cash to Santa Anita Park. They devised a scheme to use explosives in order to rob the delivery car on a freeway offramp. They returned to the construction site to procure the explosives. Inside their vehicle, they had amassed numerous weapons, including a Smith and Wesson Model 39 9mm semi-automatic pistol, a 6-inch Colt Python .357 Magnum revolver, two snub-nosed Colt Detective Special .38-caliber revolvers, an M1903 Springfield .30-06 bolt-action military rifle, a Remington Model 572 .22-caliber pump action rifle, and a .44 Magnum Ruger Model 44 semi-automatic carbine. On the evening of April 5, Davis dropped Twinning off in the mountains to steal the explosives. At approximately 11:20 p.m. (UTC-8), Davis was driving northbound on Interstate 5 south of Gorman when he made an illegal U-turn across the highway median, nearly colliding with a southbound vehicle being driven by Ivory Jack Tidwell, a military serviceman en route to Port Hueneme with his wife as passenger. Tidwell had a verbal argument with Davis and both stopped their vehicles, where Davis brandished a firearm. Tidwell persuaded Davis that the CHP was in the area, and Davis drove away. The couple immediately drove to a phone and reported the incident, complete with a description of Davis' vehicle, to the CHP. Officers in the area were informed the vehicle was wanted in connection with a misdemeanor. Then a sparsely populated area, hunting and shooting were allowed. Several minutes later, CHP officers Walt Frago and Roger Gore, partners in the same patrol car, spotted the red Pontiac near Castaic and began following the vehicle. The driver was accompanied by a male passenger. Officers James Pence and George Alleyn, partners in a second patrol car, waited in nearby Valencia ready to back up Frago and Gore. The suspect vehicle exited the freeway at Henry Mayo Drive, near the present-day site of Six Flags Magic Mountain, and pulled into the parking lot of J's Coffee Shop, adjacent to a Standard gas station. Frago and Gore ordered the two occupants to exit their vehicle. Obeying the officer's orders, Davis exited the driver's seat and walked to the front of the vehicle, where Gore proceeded to search him. Meanwhile, Frago approached the other side of the car carrying a shotgun at "port arms" with the stock against his hip and the barrel pointed in the air. As Frago walked to the Pontiac, Twinning exited the passenger seat and opened fire with a Smith & Wesson Model 28 revolver. Before Frago could aim or fire his shotgun at Twinning, he was struck by two .357 Magnum rounds and killed. Gore immediately drew his service pistol and returned fire at Twinning, but in doing so lost track of Davis, who was right next to him. While Twinning and Gore exchanged gunfire, Davis pulled a .38 Special caliber Smith & Wesson Model 49 revolver out of his waistband and killed Gore with two shots at point blank range. Shortly after Gore was killed, Alleyn and Pence arrived on the scene. Davis and Twinning immediately opened fire on them with their pistols, expending all their remaining rounds, and dove back into their own car for new weapons. In total, they had twice as many weapons as the four CHP officers they would eventually face had in their two patrol cars. Davis pulled out a sawed-off 12-gauge Western Field (re-branded Mossberg produced for the Montgomery Ward chain) pump-action shotgun, while Twinning grabbed a semi-automatic Colt M1911 .45 ACP caliber pistol. Twinning's pistol jammed after one shot, but he grabbed another one from the car and exited the driver's side. Meanwhile, Alleyn emptied his Remington Model 870 shotgun at the Pontiac, firing the gun so fast he accidentally ejected a live round in the process. A single pellet from the shotgun struck Twinning in the forehead, but it caused only a minor superficial wound. After expending all his shotgun rounds, Alleyn opened fire on Davis with his Smith & Wesson Model 19 .357 Magnum revolver, but did not make any hits. Davis returned fire with his sawed-off shotgun, striking Alleyn with several rounds of 00 buckshot and inflicting fatal injuries. Gary Dean Kness, 31, a former U.S. Marine, was en route to work when he came upon the shootout. Kness got out of his vehicle and ran over to the fallen officer Alleyn. He tried to drag Alleyn to safety, but was unable to move him. He looked up and saw Davis discard his now-empty sawed-off shotgun and grab the Remington shotgun that had been dropped by Frago. Without realizing Frago had never fired the gun, Davis tried to cycle the action of the shotgun, but since it had not been fired, it was locked on a live round. Eventually, he accidentally fired the gun into the air. Startled, he dropped the weapon and grabbed the service pistol from Frago's holster. Meanwhile, on the other side of the cruiser, Pence fired all six rounds from his .357 Magnum revolver at Twinning but missed. Twinning returned fire with his Colt 1911, hitting Pence in the chest and in both legs. Pence fell to the ground, trying to reload. At the time, the CHP did not issue speedloaders to their officers; Pence had to reload one round at a time. On the other side of the cruiser, Kness picked up Alleyn's discarded shotgun and tried to fire at Davis, but the gun was empty. As Davis opened fire on him with Frago's pistol, Kness dropped the shotgun and returned fire with Alleyn's service revolver. His shots hit the Pontiac, and a fragment from one of the bullets lodged into Davis' chest but the shot did not incapacitate him. Kness was soon out of ammunition. Pence was still trying to reload his revolver and failed to see Twinning's approach. As Pence inserted the sixth cartridge and started to close the cylinder of his weapon, Twinning shot and killed him from behind, with two shots to the head at point blank range. Kness took cover in a nearby ditch. As he did, a third CHP cruiser arrived at the scene. After a brief exchange of gunfire with the lone officer, Twinning and Davis fled the scene through the darkness in separate directions. Davis took Frago's revolver with him, while Twinning ran off with Pence's revolver and Frago's shotgun. At 3:25 a.m., Davis stumbled onto a camper parked near a dirt road. After exchanging gunfire with the owner, Daniel Schwartz, armed with a World War II surplus Enfield revolver, Davis pistol-whipped Schwartz with his empty revolver and stole the camper. Schwartz called the police and reported the theft. Within hours the camper was spotted and pulled over by deputies from the Los Angeles County Sheriff's Department. Without any more loaded guns at his disposal, Davis surrendered. Three miles away from the shootout scene, Twinning broke into a house and took one of the occupants hostage. The man's wife and son escaped and called police, and soon the house was surrounded by officers from the Los Angeles County Sheriff's Department. For the next several hours, negotiators talked on the phone with Twinning, who bragged about how he had taken advantage of Frago's mistake in carrying his gun at port. "He got careless, so I wasted him." By roughly 9 am, Twinning released his hostage from the house. After issuing a surrender ultimatum, police pumped tear gas into the house and stormed in. As police entered the residence, Twinning killed himself with Frago's shotgun. Davis was convicted and sentenced to death for the murders of the four CHP officers. In 1972, Davis' sentence was commuted to life in prison without parole, due to the U.S. Supreme Court ruling in Furman v. Georgia that found state death penalty laws were unconstitutional, and effectively invalidated all death sentences in the U.S. under existing state laws. Davis was found dead, aged 67, in his maximum-security single cell at Kern Valley State Prison, an apparent suicide, on August 16, 2009. After the shootout, the circumstances of the event were scrutinized. The CHP and other police departments re-examined their methods of training and tactics. None of the four CHP officers killed had more than two years of experience on the job. Gore and Frago were both 23 years old, while Pence and Alleyn were both 24. None were wearing a bulletproof vest, which were not widely issued to police officers at the time. Three of the patrolmen were found to have died from wounds that a standard ballistic vest might have prevented. A key mistake made by Gore and Frago, thought to be related to their inexperience, was proceeding to approach and search the suspects immediately after pulling them over. Had they waited for Pence and Alleyn to arrive within a minute or so, it is possible Twinning and Davis would have surrendered or been overwhelmed by superior firepower when faced with 4-on-2 odds. The three officers who fired their handguns were using .357 Magnum rounds, although they had trained and been certified only with .38 Special ammunition, which has less recoil. Soon after the shootout, the CHP standardized their ammunition on the .38 caliber round, ensuring all officers trained with the same ammunition they would use on duty. Lack of familiarity with their service shotguns was also cited as a problem during the shootout. Frago had mistakenly approached the vehicle with his shotgun held diagonally in front of his body and Alleyn had ejected a live round. The Newhall incident showed the difficulty in reloading revolvers under fire without a speedloader. Shortly afterward, the CHP became the first major state police department to approve and issue speedloaders. Pence might also have benefited from a backup gun when his primary revolver ran dry. In the aftermath of the Newhall shooting, although this was not based on the actions of any officer involved in the incident, the CHP modified their training to eliminate the practice of "pocketing brass" on the range (the act of picking up spent cartridge cases before reloading with fresh rounds). Several witnesses, including officers who responded to aid the four officers, said no brass casings were found in Officer Pence's clothing. 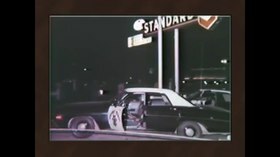 One of the first responders, CHP Sergeant Harry Ingold (retired) said he found six brass cases on the ground next to the driver's door of Pence's and Allyn's cruiser indicating that prior to being killed, Officer Pence had dumped his spent brass casings on the ground before reloading his revolver. This was confirmed by CHP Chief John Anderson in his book The Newhall Incident: America's Worst Cop Massacre. California Senate Concurrent Resolution 93, introduced by Sen. George Runner, designated Interstate 5 between the Rye Canyon Road overpass and Magic Mountain Parkway in Santa Clarita as the "California Highway Patrol Officers James E. Pence, Jr., Roger D. Gore, Walter C. Frago, and George M. Alleyn Memorial Highway" was passed on August 11, 2006. A dedication ceremony was held on the 38th anniversary of the incident, in 2008 and attended by Kness, then aged 69, who was praised as a hero. The Newhall Incident: A Law Enforcement Tragedy (2010) was a documentary produced by SCVTV. ^ a b c d e CHP: The Newhall Incident Archived October 26, 2008, at the Wayback Machine, chp.ca.gov; accessed October 25, 2014. ^ a b c The Newhall Incident: A Law Enforcement Tragedy (documentary), (2010), SCVTV; accessed October 25, 2014. ^ "Honor Roll – Officer George M. Alleyn". Sacramento, California: California Peace Officers' Memorial Foundation. Retrieved April 6, 2019. ^ "Honor Roll – Officer Walter C. Frago". Sacramento, California: California Peace Officers' Memorial Foundation. Retrieved April 6, 2019. ^ "Honor Roll – Officer Roger D. Gore". Sacramento, California: California Peace Officers' Memorial Foundation. Retrieved April 6, 2019. ^ "Honor Roll – Officer James E. Pence Jr". Sacramento, California: California Peace Officers' Memorial Foundation. Retrieved April 6, 2019. ^ "The Newhall Incident". SCVTV.com. Retrieved April 8, 2018. ^ a b c d e Nance, Richard (July 19, 2007). "April 6, 1970: Police tactics would never be the same". Officer.com. Retrieved August 26, 2010. ^ Wood, Michael E. (2012). Newhall Shooting – A Tactical Analysis. Gun Digest Books. p. 148. ISBN 1440235910. ^ "Two Notorious Inmates Commit Suicide". San Diego, California: San Diego Union-Tribune. August 18, 2009. Retrieved July 1, 2013. ^ Suicide of Bobby Davis, listverse.com; accessed October 25, 2014. ^ Newhall massacre infosite: none of the policemen wore a ballistic vest Archived October 26, 2014, at the Wayback Machine, lawofficer.com; accessed October 25, 2014. ^ "Mistake by Frago and Gore in approach", Police Marksman website, September 10, 2013; accessed October 25, 2014. ^ "Infosite". www.usconcealedcarry.com. Retrieved October 25, 2014. ^ "Setting the record straight on the Newhall incident". www.policeone.com. Retrieved October 25, 2014. ^ Pool, Bob (April 5, 2008). "CHP honors slain officers". Los Angeles Times. Retrieved August 26, 2010. ^ "Senate Concurrent Resolution 93" (PDF). California State Legislature. August 11, 2006. Retrieved March 25, 2019.